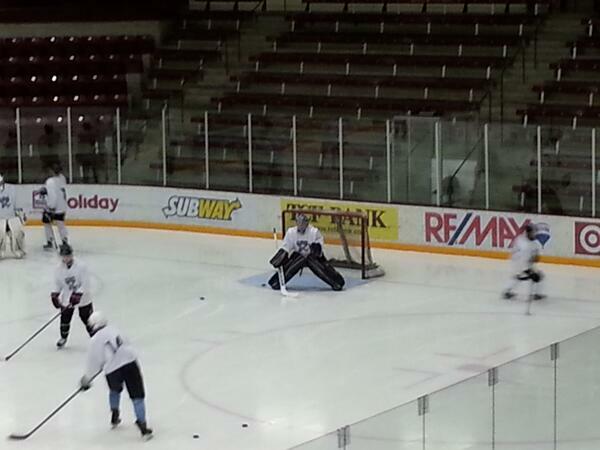 Back at it with another recap from the Lincoln Stars' 2013 tryout camp at Ridder Arena on the campus of the University of Minnesota. It was a full day of hockey, which is pretty much heaven for a hockey dork like myself. The overall quality of hockey at camp is getting better, which is good to see. I thought the games yesterday were very sloppy. I can't say I've seen anyone here that has completely blown me away, but I've been impressed with the depth of quality players at camp. I can't imagine having to pare this roster down to 25-30 players. I guess that's why the coaches make the big bucks. Team Black improved to 2-1 with a convincing 4-1 win over Team Columbia. Scoring for Black was Luke Voltin, John Simonson, Casey Linkenheld, and Ludvig Hoff (nice assist from Tony DeVito). The lone goal for Team Columbia, who fell to 1-2, was scored by Todd Koritzinsky (nice assist from Kyle Fargesen). Black goaltender Dylan Parker surprisingly played this entire game, and gave up only one goal. Not taking anything away from Parker, because he played well, but he was not tested as much compared to the Columbia goaltenders. In my opinion, Team Black is probably one of the top two teams here, and they were swarming in this particular game. Columbia netminder Joshua Stone started the first half and gave up two goals. Columbia netminder Brandon Wildung started the second half of the game and also gave up two goals. There were two fights in this game: Columbia forward Justin Loepker vs. Black forward Keegan Ward, and Columbia forward Zach Zech vs. Black defenseman Tony DeVito (who happens to be the little brother of former Stars forward Jimmy DeVito). Both fights were draws, in my opinion. Players from Team Black who stood out to me (and there were many) were Luke Voltin, Magnus Hoff, Ludvig Hoff, John Simonson, Jared Bethune, Casey Lindenheld, Michael McNicholas, Ken Citron, and Dominick Sacco. Players from Team Columbia who stood out were Todd Koritzinsky, Kyle Fargesen, Nicholas Rutigliano, Daniel Kucerovy, Paul Heger, Zach Zech, and Kyle Berry. My MVP of Team Black goes to Casey Linkenheld who has his best game of the camp thus far. My co-MVP's of Team Columbia go to forwards Kyle Fargesen and Todd Koritzinsky. Both created a lot of offensive opportunities for Columbia in this game, and worked well together. Team Red squeaked by Team Royal, and remained undefeated at 3-0, with a 4-3 shootout win in the second game of the afternoon session. Scoring for Red in regulation was Joey Molinaro (very nice assist from Dominic Lutz), Max Humitz (highlight reel assist from Taylor Maruya while falling down), and Max Freeman. Scoring for Royal in regulation was Nicholas Monfils (2 goals), and Miles Manson. Team Royal fell to 0-3 after the close loss. In the shootout, Red forwards Garrett Hehir and Tommy Marchin both scored, while the two Royal shooters were held scoreless. Red goaltender Jacob Nehama started the first half of the game and gave up one goal. Red netminder Michael Tilford started the second half and gave up two regulation goals, and stopped both White shooters in the shootout. Royal goaltender Ashton Good started the first half of the scrimmage and gave up two goals. Royal netminder Joey Staely started the second half and gave up two regulation goals, along with two goals against in the shootout. There were no fights in this game. Players from Team Red who stood out in my opinion were the Angus Acott, Joey Molinaro, Max Humitz, Taylor Maruya, Garrett Hehir, David Parrottino, and Zack Pittman. Players from Team Royal who impressed me were the Nicholas Monfils, Matt Beranek, William Scherer, Sven Jung, and Wayland Williams. My MVP for Team Red goes to forward Max Humitz (again). In my opinion, Max might very well be the best forward here from what I've seen. Oodles of speed and skill. My MVP of Team Royal goes to forward Nicholas Monfils who scored two goals and was Royal's best forward. In the battle of 1-1 teams, Yellow got a hard-fought (literally) 4-3 win over White and improved to 2-1. Scoring for Yellow was Hunter Anderson (beauty assist from Conner Thie), Miguel Fidler, Nate Repensky (good work by Jake Larson on the assist), and Eric Brenk. Scoring for White was August Von Ungern-Sternberg (two goals), and Blake Brazil (fantastic individual effort on his goal). White fell to 1-2 after the loss. Yellow goaltender Nick Schmit started the first half of the game and gave up one goal. Yellow netminder Jacob Dittmer started the second half and gave up two goals. White goaltender Michael Bitzer (yes, he's here!) started the first half of the scrimmage and gave up two goals. White netminder Sean Healy started the second half and also gave up two. It's gave me warm fuzzies to see Bitz back in the net. He's going to be a huge part of the team this next season. This game was a bit of a gong-show with a total of three fights. First it was White forward Zach Aston-Reese earning a decision over Yellow defenseman Connor Chambers. Next it was Yellow forward Hunter Anderson and White defenseman Scott Dornbrock dropping the mitts in a long tilt that ended in a draw. Lastly, it was White defenseman Zach Frye KO'ing Yellow defenseman Derek Olmschenk. Frye caught Olmschenk cleanly with a right hand, and added another as Olmschenk was falling down. It appeared that Derek was hurt badly in the fight and he did not return to the ice. I very much hope he is ok. I'm not a big fight fan, so I especially hate to see kids get injured at camp because of a fight. Sending good vibes his way. Players from Team Yellow who stood out to me were Hunter Anderson, Jake Larson, Eric Brenk, Conner Thie, and Nate Repensky. Players from Team White who impressed me were Scott Dornbrock, August Von Ungern-Sternberg, Craig Skudalski, Kenny Hausinger, Beau Browning, and Blake Brazil. My MVP from Team Yellow goes to forward Jake Larson, who has really come out of nowhere to have a terrific camp as a free agent. He hasn't had a bad game yet. My MVP of Team White goes to forward August Von Ungern-Sternberg who had two goals and is getting better in each tryout game. Bright future with this kid.